Mbwizu Ndjungu assists her husband, the Rev. Nkemba Ndjungu, with his responsibilities as Mission Superintendent of the Cameroon Mission of the Board of Global Ministries. Born in Kasaji, in the Democratic Republic of Congo (D.R.C. 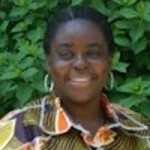 ), Mbwizu previously served as a midwife in Kazembe and Sandoa, D.R.C., and as coordinator of an “Alphabet Center for Women” in Lubumbashi, D.R.C. Mbwizu and her husband served in Dakar, Senegal, from 1998-2007. The Ndjungus were on study leave July 2007 until July 2008. Mrs. Ndjungu studied social studies and nursing at the Faculte Methodiste de Theologie de Mulungwishi in DRC from 1992-1994 where she received certification in both. She studied women’s development at the Mindolo Ecumenical Foundation from 1996-1997. Mbwizu and Rev. Nkemba are the parents of six children: three sons, Mukazu, Nkemba and Ndjungu; and three daughters, Ifanda, Mufuka and Mbwizu (deceased 9/98). How have we done with this giving?